During a pregame bullpen warmup, Chris Young warms up with a four-seam fastball. A four-seam fastball, also called a rising fastball, a four-seamer, or a cross-seam fastball, is a pitch in baseball. It is a member of the fastball family and is often the hardest (fastest) pitch a pitcher throws (for some pitchers, over 100 mph). Compare the two-seam fastball. The ball is thrown with a straightforward motion. 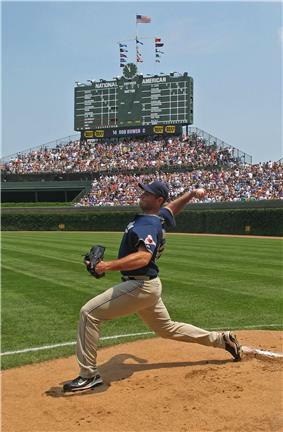 Upon the release, the ball first leaves the thumb, sliding off the fore and middle fingers at the top of the throwing motion, imparting backspin on the ball. The backspin on the ball, along with the action of the four seams all rotating into the direction of the throw, act to stabilize the ball's flight. The direction of spin on the ball creates lift, somewhat offsetting gravitational pull. The pitch comes very naturally to most pitchers (or anyone who throws a baseball), and is often one of the first pitches taught to young pitchers. This is because the pitch requires very little unnatural motion and the ball comes off the fingers very easily in the way the pitch was intended to be thrown. It is the most common pitch thrown by most pitchers, and almost all pitchers at any level can throw the four-seamer as part of their repertoire. The four-seamer is intended to overpower hitters with its velocity. A successful four-seamer pitch gets through the strike zone before the hitter can determine its speed and direction. Therefore, the faster and more accurately a four-seamer pitch is thrown, the more effective it will be. An effective four-seam fastball is very difficult for a hitter to get around on, and to get the sweet spot of the bat on, because the hitter must swing very early to catch up to the pitch. Because the four-seamer lacks break, it is easy to hit if the hitter is able to anticipate where the pitch will be thrown. The pitch's effectiveness also decreases substantially if it cannot be thrown accurately for strikes. Unlike some other pitches, because of its straight and level flight, it will not fool many hitters and produces few swings when thrown out of the zone. Its velocity also enables batters to hit it extremely hard; if a hitter can square up on it, a four-seamer pitch can be readily hit for power. Scientific studies have shown that the four-seam fastball and the two-seam fastball have identical flight paths, but the batter does perceive a difference between them. The difference is due to flicker fusion threshold. Flicker fusion threshold is defined as the frequency at which an intermittent light stimulus appears to be completely steady to the average human observer; e.g., for a series of pictures to appear to create a moving picture, the frequency of the picture shown to a viewer has to be changed at a rate greater than the flicker fusion threshold. The flicker fusion threshold for humans is around 60 Hz. ^ Kindall, Jerry (1988). Baseball: Play the Winning Way. Time, Inc.